My husband has suffered from gout for several years. He is in his 60s. I am in my 50s and my first attack just happened. I was working and my right foot from the thigh to the ankle was very sore. 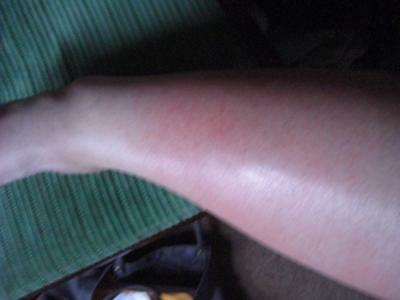 When I got home from work, it was very red like a sunburn, to touch it is very hot. It progressed down my calf and is stationary in the calf and ankle area. I am elevating it and staying off of it. I didn't notice any symptoms because I am diabetic, non insulin dependent. Often I eat Lettuce and Tomatoes for lunch and dinner and stay away from carbs, juices, pop, and drink water. in the past two years I have lost some weight, I walk for exercise, I work multiple retail merchandising jobs. Since I have been diabetic and even prior to my diagnosis, my toes and bottom of my feet itch a lot. They get dry, cracked, bleed into tiny ulcers, turn black. I have redness and purple color around my ankles and toes. They are crusted. I have told my doctor these may be symptoms of Candida, interdigitalis blastomycetia, systemic lupus and he thinks I am self diagnosing. If I can help someone out there eliminate some of this stuff by shareing, that would be good. I have no insurance and can't see my doctor for preventive care as I can't afford an office visit, let alone my meds. My husband is on state coverage and medicare(disablity). His caseworker told me my illness is not chronic enough to continue medical coverage and my doctor won't sign a form stating I am chronic enough, so I can no longer take care of my health. Perhaps when I can no longer walk from Gout and other ailments, I will be chronic enough for them to allow me treatment. You will need to see a doctor to get a prescription for Cimetidine for gout. Is that Cimitdine sold over the counter? Thx in advance. Elane, I have tried almost all of the natural so called cures for gout. DON'T WASTE YOUR MONEY OON THAT ROUTE. There is a medicine called cimetidine (trade name Lenamet), it is actually an H2 blocker. There is 200mg and 400mg. Take the maximum daily dose of 400mg. IE 4 X 400mg daily. It does knock the gout out completely in 3 to 4 days. If you like write to me on [email protected] and let me know how it goes. It is a very cheap cure. After spending 10's of thousands of dollars on natural cures which do not work, a pharmacist told me about the cimitidine. It works well, also with other gout sufferes that I have told them about. All y sympathy and best wishes. From Godwin. Join in and write your own page! It's easy to do. How? Simply click here to return to Gout Symptoms.